What a beautiful post Barbara, I enjoyed every word! I loved the photo's too. Wonderful! That's brilliant Barbara, sounds like a great day out. Never knew you could do that here, all very Lord of the Rings hunter-style really. oh Barbara, I'm riven with jealousy. I love birds of prey. I was just out singing to my chickens, as they settled on their perch and I think that is pretty special. But a hawk! An owl! I must find a 'hawk walk' here. The novel I'm working on has a red-shouldered hawk as the protagonists totem. Wow, Barbara, that's some damn fine writing. I love the last couple of paragraphs. “I too could know the unknowable except unlike Owl, I have forgotten how.” Brilliant! And I now have an image of you and Owl, sitting on the couch exchanging wisdom and witty Bon Mots. I think there might be a sitcom in that! 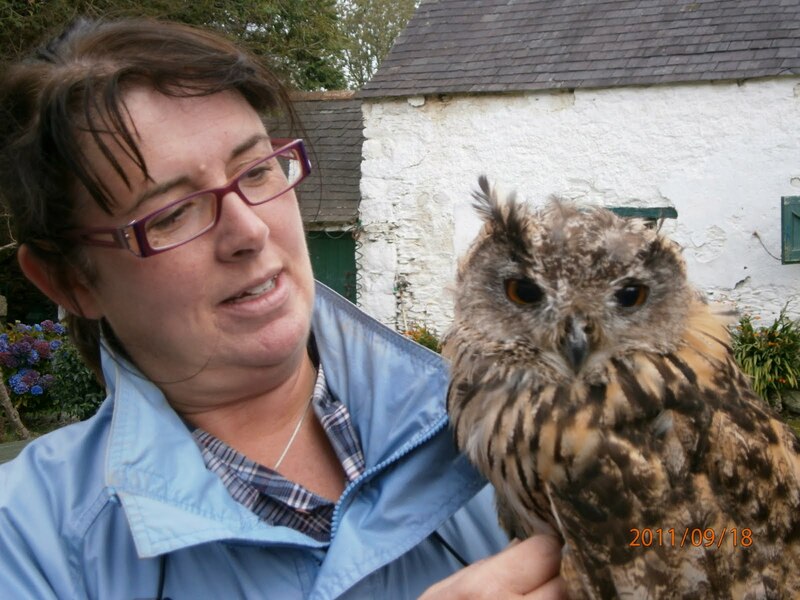 Thanks Jane and Susannah – I'm so glad you enjoyed my owl tale! Maria – thanks so much…and Derek – praise for my writing from you guys is much valued. Hi Jan and Niamh – it was a day I will remember always – just wonderful. Thanks for dropping by. What a beautiful piece of writing. It made me go all goosebumpy. I had a similar amazing experience, flying and feeding owls, a couple of years ago, so know exactly what you mean about feeling that connection, while at the same time feeling a sense of awe for these birds. Your post brought it all back to me. Thank you.